Take a peek backstage with Props Supervisor Faye Armon-Troncoso – In this video, Faye brings us backstage (and onstage) to show off some of the props for Westport Country Playhouse’s production of Romeo and Juliet. Adam Savage Explores the Props of Blade Runner 2049! 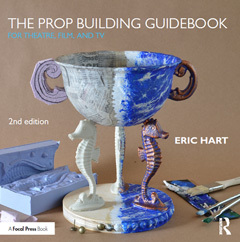 – Everyone’s favorite prop aficionado meets with prop master Doug Harlocker in this video. They take a look at all the whiz-bang gizmos and gadgets in the newest Blade Runner film. Sketch Your Way to Better Designs – Christopher Schwartz discusses why he carries a spiral-bound notebook with him at all times and how it helps him solve tricky fabrication and construction dilemmas. Blakes7 Bracelet. Make your own – Take a step back to 1978 when Blue Peter, the famous BBC children’s program, demonstrated how to build a sci-fi prop from the Blake’s 7 series.